I've been in Los Angeles now for a total of four days and I swear I've been saved by two products, both bronzers. Yes, my pasty white self has come over for seven days of sun while I work and, for fear of looking like a complete fish out of water, I've relied on saviours like self tanners and great bronzers that allow me to blend in with the tanned masses. This all got me thinking about bronzers in general and a post was born - a post about the best bronzers out there at the moment. Over the past few years, I've relied on one bronzer to see me through with contouring a tanned and structured appearance- the Estee Lauder Bronze Goddess Powder. The compact itself is absolutely massive and it's just one of those beauty items that feels essential and glamourous, from the tortoiseshell-like container to the massive bronze brush that is contained within. The product itself does exactly what it promises - with great staying power. You are indeed a bronzed goddess with this tool in your bag of tricks and I can safely say I'll never leave home without it - and haven't for the past two years at least. Now, that all being said, I have been introduced this year to a bronzer that is definitely a splurge, but that I actually use in conjunction with my Estee Lauder Bronze Goddess. Tom Ford's Bronzing Powder requires a bit of a thicker wallet for purchase (it's nearly double the price of the Bronze Goddess), but it's a bronzer that is definitely worth a look. Tom Ford gives us a bronzer that not only tans, but also adds sparkle, with a light gold dust that's left behind on the cheeks to give a sunlit sheen. So I throw on my Estee Lauder as a bit of a bronzer base and use Tom Ford to enhance with a gold dusting and added chiseling. 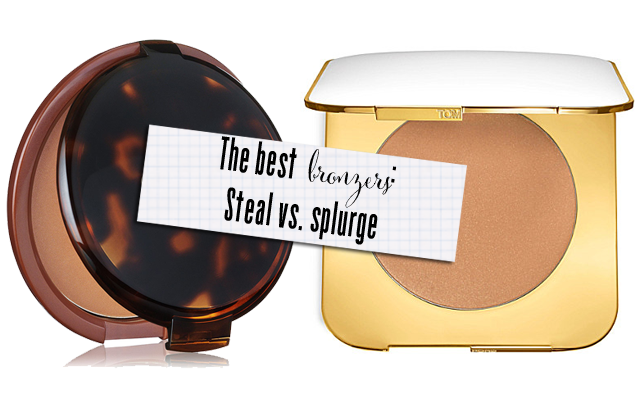 There you have it, folks - two bronzers, one splurge, one steal, both part of a well balanced beauty diet!